Since I am very fresh rolling with my recent decision to become a vegan/vego, I figure that I may as start classifying what I eat not only for helping people out there but even just to remember what I’ve liked and haven’t on my journey. It’s early days and I haven’t gotten any further than the local Woolies so the variety is pretty non-existent so far. But it’s somewhere to start and to be fair, Woolies seems to be trying hard to do the right thing with their ‘Macro‘ line of goods, and clearly identify non-dairy options within that line. Woolworth’s has strikes against it however which may preclude shopping there much, as they contribute heavily to gambling addiction in this country and own an awful lot of pokie machines. Buying goods is never as straightforward as you think, now is it?? NOTE: I am coming from the perspective of a recent/former meat-eater who is not trying to show how much different vegan products are from their original counterparts, but rather if they can stand alone as decent things to eat, while still trying to somewhat satisfy my cravings for the originals. So I’m not going to come down too hard on them unless they are just truly nasty-tasting, but they will get top marks if they are both delicious and provide a great replacement for the original meat or dairy product. Parmalat Soy Life Yogurt – Vanilla Creme flavour. FLAVOUR: I like vanilla so it was quite faithful to that. Vague soy element but overall quite yogurt-like. TEXTURE: very yogurt-like in texture and consistency. PRICE/VALUE: $3 for 2x175g so not much more than other individual-pack yogurts. I couldn’t see a bulk one but would buy that next time. 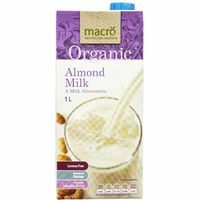 Macro (Woolworth’s) Organic Almond Milk (sweetened; tetra pack) FLAVOUR: Other than subtle almond/soy flavour, very milk-like when drinking straight. I imagine you could easily disguise it as milk in anything. TEXTURE: same consistency. Would be hard to detect as not milk in tea/coffee/cereal, etc. PRICE/VALUE: $3.39 for 1 litre so about 2.5 times the price of a Devondale tetra 1 litre. I like that it is organic though as its competitors aren’t. I couldn’t find any other cheese or yogurt substitutes in Woolies, and they didn’t do a mayonnaise alternative there. I did buy a Sanitarium Soy Milk (So Good) but haven’t tried it yet. I’ll be seeking other replacements this week at a couple of dedicated health/vegan shops and online. Sanitarium Bacon Style Rashers. FLAVOUR: Kind of not really bacon but also just bland. Bacon has such an intense flavour that it really needs to be amped up here. In a BLT type sandwich, you could barely tell it was there. On the fry-pan, it does manage to get that bacon smell though and if you cook it to near crispy it’s a bit better. TEXTURE: as I would expect, simulating bacon’s texture and mouthfeel i s tough, and this doesn’t really come close or tries to really. More like a processed sandwich meat. PRICE/VALUE: $4.50 for 145g so expensive-ish compared to real bacon and doesn’t really deliver. 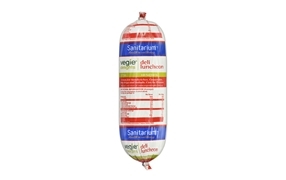 Sanitarium Pepperoni (spicy). FLAVOUR: Better than the bacon for sure. Pleasant to eat directly and on a pizza it was quite effective. Not as intense as real meat, but pretty good substitute. TEXTURE: a bit similar to the soy cheese in texture. Or the bacon perhaps, but that is more like real pepperoni. PRICE/VALUE: $5.75 for 200g so about twice the price of normal pepperoni. I’ve heard about a chicken product by Beyond Meat in North America which is supposedly the first non-meat product to have nailed the mouthfeel and flavour of chicken. This makes me very excited and I hope it’ll make it to Australia in the near future. I’ll be in Canada/US mid-year, so if not before then, I’ll see what it’s like when I get there! EDIT: Some research on soy has alerted me to just how bad these unfermented products are for us except in extreme moderation. Check out my blog entry on this! I’ll keep updating reviews as I get products over time!